Resumiendo el artículo, podríamos decir que una vez más y respecto a la tecnología, “General Dynamics, a verlas venir”. Raytheon en colaboración con BAE diseñó un proyectil que en las pruebas de disparo a 30 kilómetros de distancia, las coloca a un metro de distancia del objetivo de promedio. BAE Systems (BAESY) fabrica el M109A6 Paladin, obús de 155 mm., y Rautheon los proyectiles Excalibur. Cada Paladin, lleva 39 proyectiles de 70.000 $ cada uno, y el ejército USA ha comprado 975 “paladines”. Cargarlos, supone 2600 millones de $ para Raytheon. Además, puede ser disparado desde cañones de 155 mm. incluyendo los obuses estadounidenses M198 y M777, el Panzerhaubitze 2000 de Alemania, en el Reino Unido el AS-90, y Sistema de Artillería Archer de Suecia. El artículo menciona que entra en competencia con los obuses de General Dynamics de 1000 $ por proyectil, “proyectiles “tontos” ya que los expertos del Ejército estiman que puede tardar de 10 a 50 rondas no guiadas para destruir un objetivo que Excalibur puede llevar a cabo en un solo tiro”. Se eliminan los daños colaterales de los bombardeos y no se ha de cargar una cantidad ingente de munición que no garantiza destruir el objetivo. Mal futuro para el acuerdo de General Dynamics y la venta de obuses a Colombia. Smart bombs. Laser-guided missiles. Actual laser guns. The weapons that America’s defense contractors churn out often seem like the stuff of science fiction. The platforms that deploy them, too, sound unfailingly high-tech: “fifth-generation” fighter jets, “drone” aircraft, and “stealth” warships. But did you know that one of the military-industrial complex’s most important inventions comes out of the barrel of a howitzer? It’s called the “Excalibur,” and it’s a 155-millimeter howitzer round that creator Raytheon (ticker: RTN ) says can target an object 30 miles away and consistently hit within two meters of that target. To put that in perspective, say you set up a Paladin self-propelled howitzer in San Jose, Calif., and stood William Tell’s son somewhere in the suburbs of San Francisco with an apple on his head. Say you then told the Paladin to hit the apple with an Excalibur round. Excalibur might miss the apple — but nine times out of 10, it’ll nail the younger Tell somewhere between socks and eyebrows. Now, you’ll notice that this article specifically cited Excalibur rounds fired from a Paladin self-propelled howitzer. This was not unintentional. BAE Systems’ (BAESY) M109A6 Paladin is key to the argument for why Excalibur is important to Raytheon. Raytheon, in partnership with BAE, designed Excalibur to be fired from the Paladin (among other weapons systems). The Paladin’s ammunition magazine holds 39 rounds. And at last report, the U.S. Army and National Guard had bought a total of 975 Paladins for their arsenals. What’s so great about Excalibur? Paladins today ordinarily carry 39 unguided howitzer rounds, which are produced by arms makers including General Dynamics (NYSE: GD ) and Esterline (NYSE: ESL ) and cost about $1,000 each. But because such rounds are “dumb,” Army experts estimate it can take anywhere from 10 to 50 unguided rounds to destroy a target that Excalibur can take out in a single shot. So on average, a Paladin firing unguided rounds might have to nearly empty its magazine to destroy a target that — if armed with Excaliburs — it could destroy with just one shot. Replacing dumb rounds with Excaliburs would hurt revenues at General Dynamics and Esterline. But it should permit a Paladin to destroy targets faster and destroy more targets, and to cause less collateral damage in the process. And because the Paladin won’t go through its ammunition as quickly, the Army won’t need to load, ship, unload, and reload as much ammunition — saving vast amounts of money up and down the supply chain. 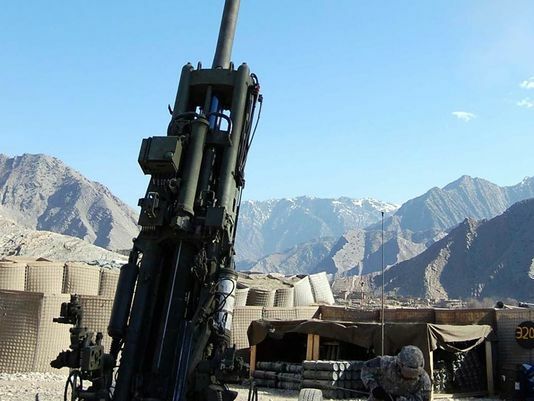 When you consider the efficiencies Excalibur permits on the supply chain “tail,” the Army may very well end up saving money by buying Excaliburs — even at 70 times the cost of a conventional howitzer round. The superiority of the Excalibur over conventional howitzer rounds — in range, in accuracy, in efficiency of operation of the Paladin, and in cost to transport — will make this product incredibly attractive to the military. Even at $70,000 a pop, the Pentagon is going to buy a lot of them. Indeed, they’re already buying a lot of them. In recent months, we’ve highlighted two big purchases of Excaliburs — one in August last year, for 765 rounds, and a second just last week, for 757 more. Each one of these purchases was for more rounds than all the Excaliburs fired in anger… ever. It’s easy to see how the humble howitzer could become a multibillion-dollar business for Raytheon. And even on a business as big as Raytheon’s ($23.3 billion in sales last year), it’s going to be big enough move the needle. Galería | Esta entrada fue publicada en Hemeroteca y etiquetada BAE SYSTEMS, General Dynamics, Obús 155/52, Usa Today. Guarda el enlace permanente.